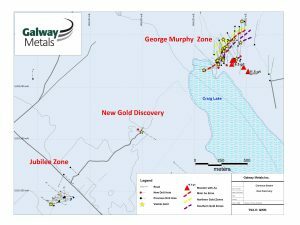 Galway Metals: New Gold Discovery at Clarence Stream and Strong GMZ Drill Results - Galway Metals Inc.
(Toronto, Ontario, January 23, 2019) – Galway Metals Inc. (TSX-V: GWM) (the “Company” or “Galway”) is pleased to report that drilling at its Clarence Stream Gold Project in SW New Brunswick has been successful in discovering a new gold zone centered between and along strike the George Murphy and Jubilee zones (Figure 1). 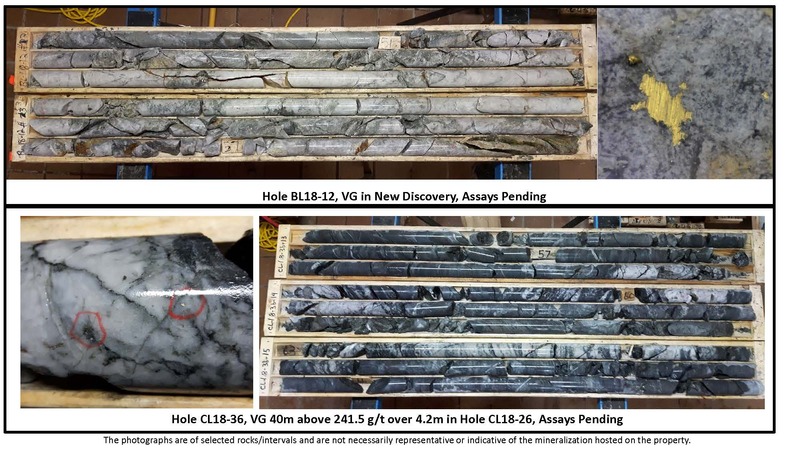 The discovery hole, BL18-12, intersected weathered, altered sediments with disseminated pyrite and arsenopyrite and multiple quartz veins containing visible gold over 7 metres starting 51 metres downhole (Figure 2). Assays are pending. 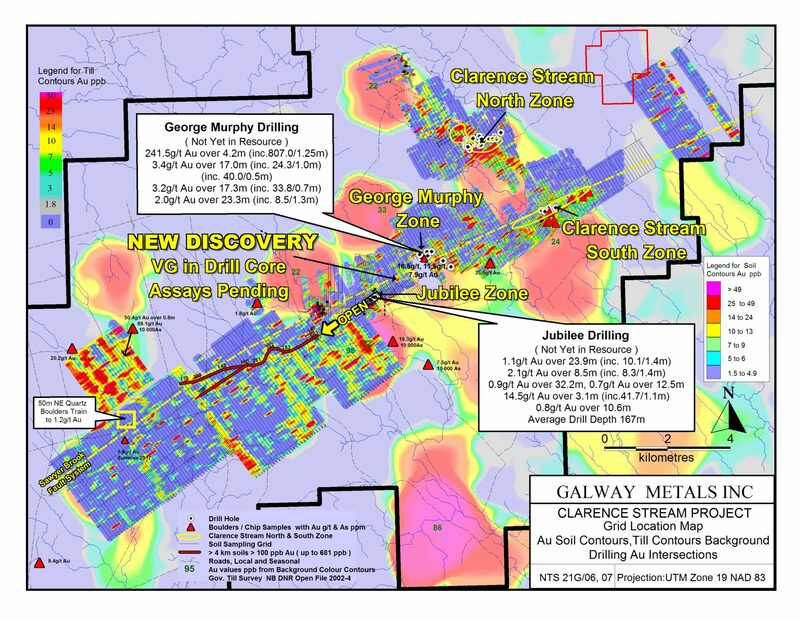 The new gold discovery is the fifth to date at Clarence Stream and the second made by Galway in the two and a half years the Company has been drilling the project. 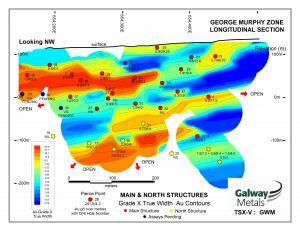 The Company is also pleased to report encouraging assay results from three additional drill holes and two extensions (1,524 metres) in the George Murphy Zone (GMZ) at Clarence Stream, the discovery of which Galway first reported in December 2017. 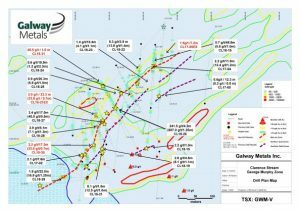 This brings Galway’s total drill results reported to date at the GMZ to 9,451 metres in 32 holes. Four additional drill holes at the GMZ were undertaken since, with visible gold seen in 3 of the 4. Assays are pending. 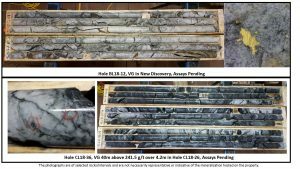 One of those holes intersected visible gold 40 metres above previous hole GWM18CL-26 that returned 807.0 g/t Au over 1.25m within an intersect that graded 241.5 g/t Au over 4.2m (Figure 2, Figure 3 and Figure 4). “The discovery of a fifth gold deposit at Clarence Stream shows the effectiveness of our exploration program and points to the strong prospectivity of this new gold belt in New Brunswick. The George Murphy Zone is filling in and expanding nicely, and remains open in all directions. Looking forward, our plan is to follow up with more holes in the new discovery area, and to then expand the Jubilee zone before moving further west in search of additional new discoveries where a high-priority, four-km long, high-grade soil anomaly exists. We then plan on returning to the GMZ to follow up on wide-open drill targets. Given these and other strong targets and deposits already identified, we believe Clarence Stream represents an exciting new gold district in eastern Canada” cites Robert Hinchcliffe, President and CEO of Galway Metals. GWM-18CL-30: 3.2 grams per tonne (g/t) Au over 17.3 metres (m) at a vertical depth of 70 m below surface, (including 33.8 g/t Au over 0.7 m, 9.0 g/t Au over 0.5 m, and 5.5 g/t Au over 0.7 m), plus 13.4 g/t Au over 0.5 m.
GWM-18CL-21 (extension): 2.0 g/t Au over 23.3 m at a vertical depth of 220 m below surface, (including 8.8 g/t Au over 1.0 m, 8.5 g/t Au over 1.3 m, and 5.7 g/t Au over 1.4 m). GWM-18CL-31: 0.7 g/t Au over 26.9 m at a vertical depth of 166 m below surface, (including 2.1 g/t Au over 1.0 m, and 2.3 g/t Au over 1.0 m), plus 45.5 g/t Au over 1.0 m, plus 1.3 g/t Au over 4.0 m, plus 2.8 g/t Au over 1.0 m.
GWM-18CL-05 (extension): 1.6 g/t Au over 7.2 m at a vertical depth of 235 m below surface, (including 5.6 g/t Au over 1.1 m), plus 0.9 g/t Au over 8.4 m, plus 3.3 g/t Au over 0.7 m, plus 1.0 g/t Au over 4.0 m (265 m below surface). GWM-18CL-05 (extension): 1,650 g/t Ag over 1.0 m at a vertical depth of 377 m below surface, demonstrating for the first time the presence of very high-grade silver mineralization in GMZ drilling. 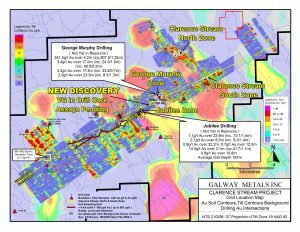 Galway had set 200,000-260,000 ounces of gold as an exploration target for the GMZ. Parameters used in arriving at this target are that mineralization would be hosted within a 400m length by 400m depth area and consist of a 10m average width zone at 1.6 to 2.0 g/t Au from surface to 150m, and a 3m wide zone at 4.0 to 5.0 g/t Au below 150m. This was based on the first intersections received, and the presence of wide zones of quartz where narrower, higher-grade intersections have been received. While the new drill results provide further support for this GMZ resource target, it remains uncertain if a mineral resource estimate will be delineated. The potential quantity and grade are conceptual in nature, and there has, to date, not yet been sufficient exploration to define a mineral resource. On September 26, 2017, Galway issued a resource update on the South and North zones at Clarence Stream, prepared by SRK Consulting (U.S.) Inc., with total Measured and Indicated resources of 390koz at 2.0 g/t Au and additional Inferred resources of 277koz at 2.5 g/t Au, in addition to Inferred antimony resources of 22mlb at 0.37% (Table 1). 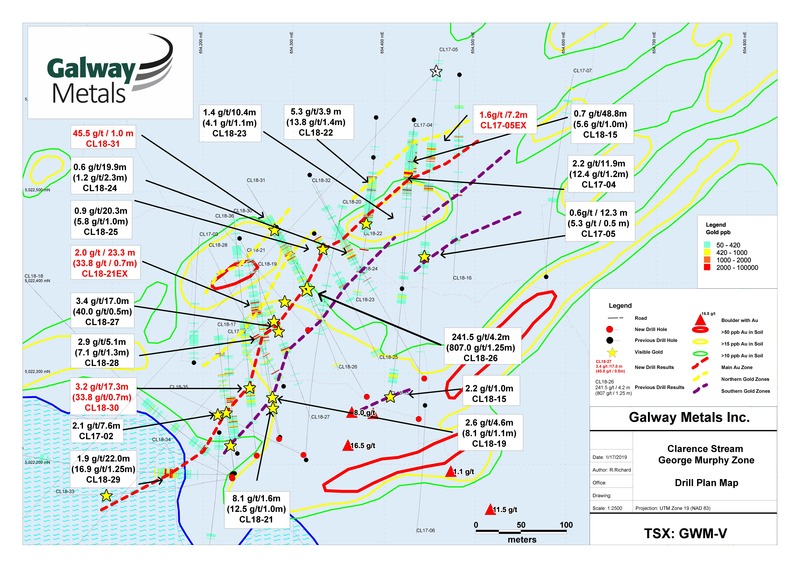 Subsequent to the cut-off date for that resource estimate, Galway drilled an additional 1,873 metres in 12 holes in the South zone and 1,245 metres in nine holes in the North zone, which included highlights such as 11.8 g/t Au over 12.4 m, 7.6 g/t Au over 12.0 m, and 17.4 g/t Au over 5.9 m. These will be incorporated in the 2019 resource update, as will, for the first time, the George Murphy and Jubilee zones. The GMZ is located 2 km east of the Jubilee Zone and 4 km west of the South Zone (Figure 5). The 3.2 g/t Au over 17.3 m intercept in hole 30 is located in the Main structure of the GMZ and is 127m west and along strike of the previously-reported intersection of 807.0 g/t Au over 1.25m from hole GWM18CL-26 (within an intercept that graded 241.5 g/t Au over 4.2m), and 80m west and along strike of the previously-reported intersection of 3.4 g/t Au over 17.0m. Holes 5 extension, 21 extension and 31 (1.6 g/t Au over 7.2 m, 2.0 g/t Au over 23.3 m, and 0.7 g/t Au over 26.9 m, respectively) have extended the North structure of the GMZ to depth in all three areas. This structure was also intersected in hole 17 (0.9 g/t over 7.2m), which gives this North structure a strike length of 310m. It is wide open above 190m and below 265m vertical as it has been drilled only in the 190-265m range below surface. The GMZ has a strike length of 500 metres; open in every direction. The gold bearing structures at the GMZ have been drilled to a maximum of 265 m vertical, although most drilling is down only to 130 m. Based on closely spaced drill holes on the east and west ends of the deposit, the zones appear to dip steeply to the south. The current interpretation may be subject to change; a small roll in the Main structure strike may be due to a fold, a fault offset, or there may be separate structures. High grade silver discovery at depth – In addition to gold mineralization, Galway has intersected very high-grade silver mineralization for the first time in GMZ drilling. Hole 5 returned an intersection of 1,650 g/t Ag over 1.0m, located at a vertical depth of 377 metres and north of the gold structures, and possibly outside the GMZ deposit. 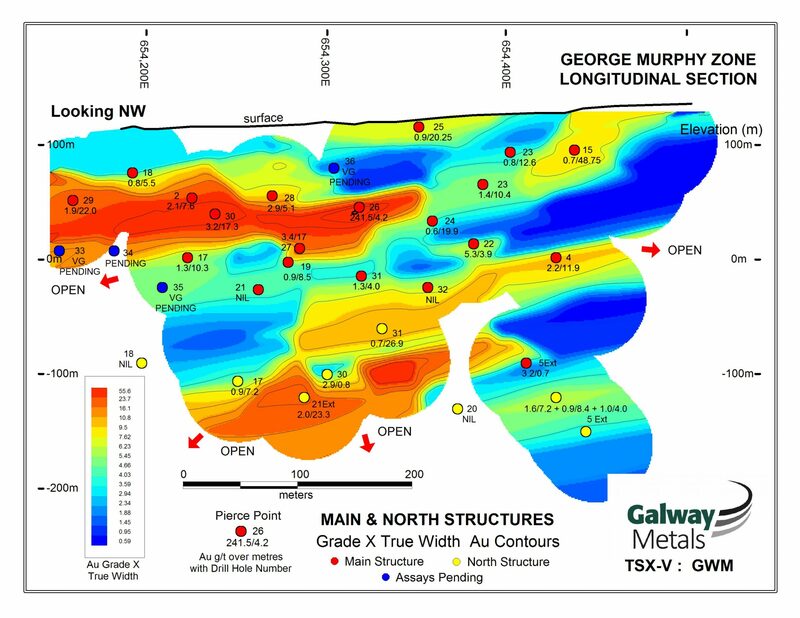 It is associated with a 50cm breccia vein and likely lines up with an intersection in hole 20 of 127 g/t Ag over 0.9 m.
Galway plans to drill a series of follow up holes around the new discovery and to then expand the Jubilee zone in several directions. Jubilee is currently a relatively small zone where 5,202 metres in 31 holes have been drilled. This drilling resulted in the identification of three structures along 270 m of strike and to a depth of 89 m. Refer to Figure 5 for drill highlights of the Jubilee zone. Galway’s goal is to significantly expand the deposit prior to completing the 2019 resource update. Galway is also planning on drilling a four-km long, high-grade soil anomaly that is located 2.5 km to 6.7 km along strike to the west of Jubilee (Figure 5). This target contains 11 samples greater than 100 ppb gold, with the highest at 681 ppb. For comparison, 10 ppb is considered very anomalous, and the highest soil in the GMZ was 86 ppb. VG = visible gold. 0.42 g/t Au was used for the bottom cut-off; True widths are unknown if not noted. VG in hole 31 was assayed by metallic screens method (58.1 g/t Au by gravimetric). **Previously released. The mineralization consists of 10-70% quartz stockworks and veins with 1-5% fine pyrite plus pyrrhotite plus arsenopyrite in sericite altered sediments. A more complete description of Clarence Stream’s geology and mineralization can be found at www.galwaymetalsinc.com. Galway would like to acknowledge financial support from the New Brunswick Junior Mining Assistance Program, which partially funded drilling of the GMZ.